Under the direction of Gaku Homma Sensei over eighty Nippon Kan volunteers gathered for the 11th Annual “Put the Beds to Bed” project in conjunction with the Denver Parks and Recreation Department. 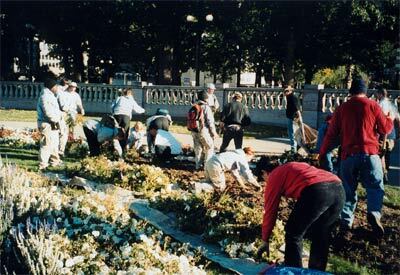 Every fall, the flower beds in Civic Center Park located directly west of the Denver State Capitol Building need to be turned for winter. It has been the Nippon Kan “Army” (as we have been named by the Parks Department) who have “Put the Beds to Bed” for the past eleven years. In light of recent national tragedies, Homma Sensei’s focus this year was to turn our attention toward our own communities as a way to help our national spirit. The beds were turned in record time again this year in just over two hours. Many thanks to Homma Sensei for coordinating this event again this year. This event plus our annual spring volunteer project with the Denver Parks and Recreation Department are a major part of Nippon Kan’s annual volunteer community service.